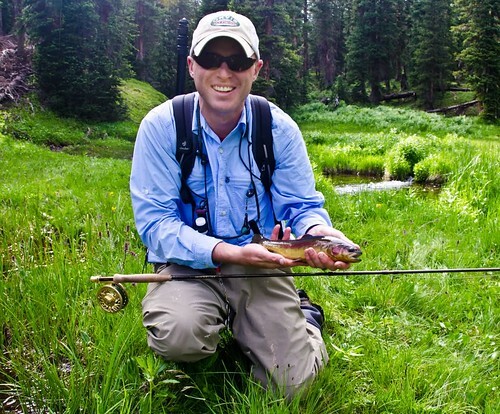 Jonathan Hill with a Colorado golden trout, a fish that many thought had gone extinct. 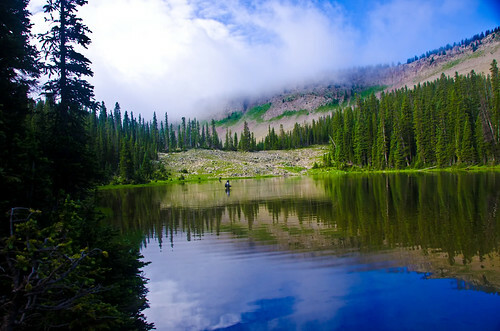 For the past eight years, I have been hiking in to some of the most remote high mountain lakes in Colorado. I am not saying that I’m a snob and I thumb my nose at the beautiful rivers we have here, but it is nice to get a little bit of exercise along with your fishing. It is also nice to get away from the crowds that frequent the Gold Medal fisheries that we are lucky enough to have across the state. This year, one trip in particular captured what I find magical about the high country. Hiking off-trail made for some arduous climbs through difficult terrain. I planned the trip for earlier this summer, and three of my buddies—Rick, Mike, and Ryan—were dumb enough to come along. This adventure was different than any of us could ever imagine, and harder than we could possibly make up. We were going in search of golden trout. 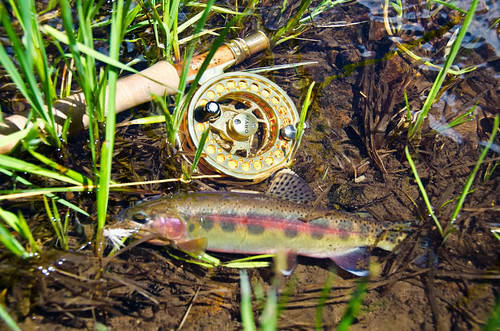 Most anglers know that golden trout are native to California (in fact, it’s the state fish) and are also stocked in Wyoming. What you may not know is that the golden trout was also stocked in Colorado back in the 70s and 80s. However, most biologists believe that the golden was unable to reproduce in the high mountain lakes and therefore became extinct decades ago. We didn’t believe them. as far as golden trout were concerned. Luckily, they struck gold elsewhere. Going on a tip from a biologist friend and a hunch that we might be lucky enough to stumble upon these fish, we set out for a five-day, 30-mile trek into the wilderness. 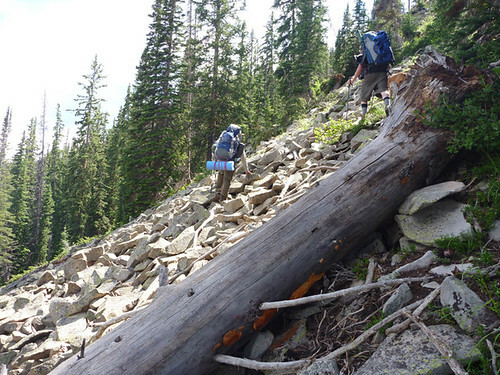 Since portions of the hike were off trail, we had to bushwhack over deadfall and boulder fields to reach our destination. The first day took us nine hours and totaled fourteen miles. Needless to say, I was happy to get my 52-pound pack off my back and set up camp. 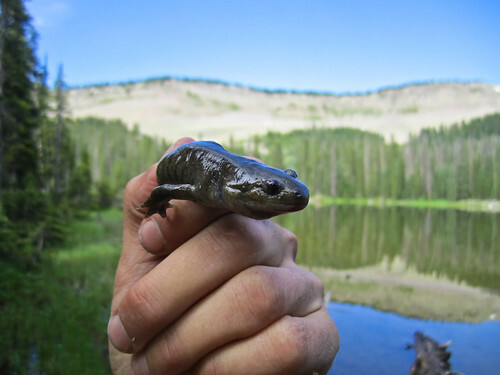 The only thing willing to strike a fly was this 8-inch salamander. The following day, we set out to fish a couple of lakes that we hoped were not barren. After putting on waders and hiking through the brush and boulders, we waded into and fished two lakes for a solid five hours. The only bite I got was from an eight-inch salamander. Chalk that up as a first! Anyone else ever catch a salamander on an Orvis rod before? turned out to be the mother lode of golden trout. After we headed back to camp for lunch, a little dejected, Rick decided to take a walk downstream and follow a creek that isn’t on any maps. Halfway into my sandwich, I heard Rick stumbling and bumbling back up to camp. The only thing he could get out was “I FOUND THEM!” At this point everything gets a little blurry, but we all grabbed our rods and ran downstream. I probably should have been a bit more careful but I hurled myself over trees, branches and sharp objects that should have pierced the sides of my legs. These gorgeous trout made the arduous hike into the wilderness all worthwhile. Jonathan Hill is a digital graphics manager who lives in Littleton,Colorado. 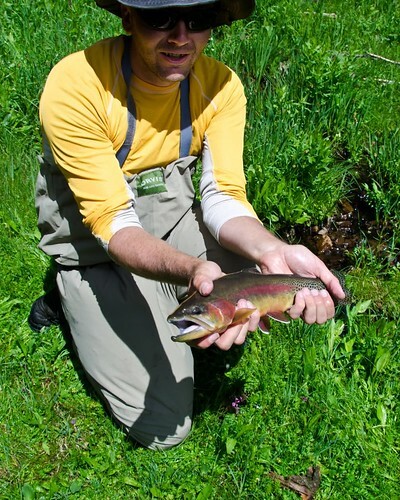 A request of Jonathon Hill, would you be willing to share a photo of a Golden Trout from your trip? I would like to use it in my upcoming book and intend to pay a fair fee for a copyright license. I would also be willing to keep your locations confidential. I caught My only golden in Wyoming but the resolution of my photo is inadequate. 30 years ago I caught a Golden here in Colorado and have been back to that lake several times since with no sightings of Goldens. From the late 80’s and into 2002 myself and others caught these magnificent trout. unlike the other here I will tell you where they are. Stop just about anywhere along I 25, look west, and there you have them! I caught some golden trout last August in an easily accessed stream. I was so surprised I had to have someone verify I was not hallucinating. They must have been illegally put there.